Here we are with yet another review of a great engine by CC Racing Engines! 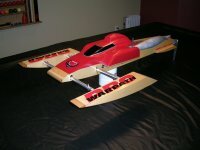 Since the mid 90's CC Racing have been making top quality record setting R/C boat engines. They are consistently working on getting more out of these little Zenoah engines and "The Beast" engine is no exception! This all new engine is based on the CNC porting that was introduced by CC Racing in 2009 in their Pro-Mod 260. With the recent changes in IMPBA engine classifications, the folks at CC Racing Engines saw an opportunity to improve on the current Pro-Mod engine. In the past, the rules prevented the use of components from different manufacturers inside a legal LS27 engine, but with the new rules limitting only displacement (now called LSG27), a lot more could be done to the Zenoah 260 to get the most out of them, and CC capitalized on this. The new Beast engine was thus born. Based on the same high precision porting (CNC and hand finished) as the Pro-Mod 260, the Beast's most important added feature is the use of a 1mm "Stroker" crankshaft. This crank, as the name states, adds 1mm of extra stroke to the engine. What this does, in short, is allows for the engine to take in more air and fuel per stroke thus creating more power. The reason using such a crank wasn't legal in the past under the old IMPBA rules is that Zenoah do not manufacture a 1mm Stroker crank and thus to build such an engine a crank from a different manufacturer must be used. This was illegal under the old IMPBA rules. 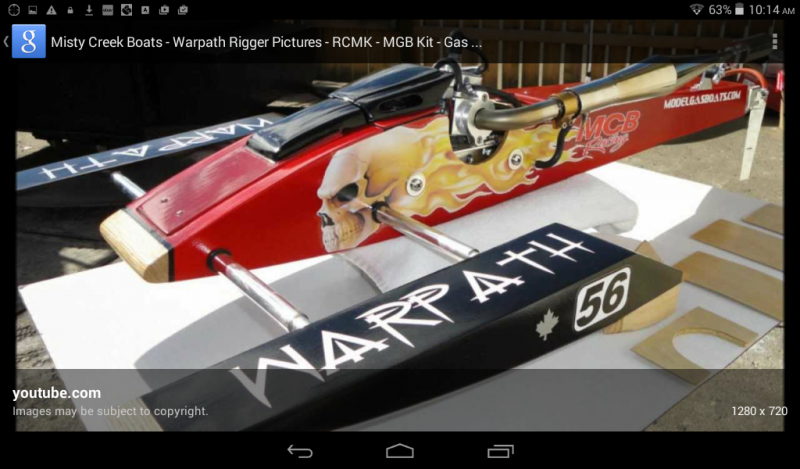 Here are a few pictures of the porting done by CC Racing. One would be hard pressed to find cleaner and more accurate port work! To get the most efficiency out of this powerplant, CC have added their own exclusive ceramic bearings and zero drag seals. Another feature is the flywheel which is machined to proper specs to reduce overall weight and maintain reliability. This helps in overall better RPM and quicker windup. The rest of the package is as would be found on a standard CC Racing Pro-Mod engine...in other words, CNC lightened piston, copper base gasket, billet aluminum carburetor isolator block (annodized and etched), modified Walbro WT-257 carburetor, billet aluminum needle clamp and all stainless steel bolts package on the engine. What kind of performance can you expect from this engine you ask? Well, let me just put it this way. 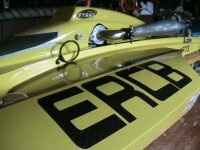 I have been running CC Racing Pro-Mod engines in my boats since 2006-2007. The first ones were the hand ported engines. The performance was great. Then in 2008-2009 I started running a few of the CNC Pro-Mod 260's. Again performance was great. I did however notice that the throttle response seemed to be better and overall the engines seemed a little bit better. I attributed this to the fact that the porting is absolutely symetrical in the cylinders/pistons. This season I ran two of the Beast engines. So I was running two of each generation basically. I will be absolutely honest here, the difference from one generation to the other is not that drastic, especially if running them in boats like monos which are easy to push, but where the difference was really noticeable was in the torque of the engine. I noticed this more in my cats and hydros. You have to understand that I was afterall comparing the Beast to some already VERY good engines! Still, the perfromance overall was better, and if you are looking for every little bit of extra umph, the Beast will deliver. You can expect to pull a little bit more prop in most cases, and in turn be faster. If you don't pull more prop, you will definitely pull stronger through the turns, and that in most cases is where races are won! I have tested the Beast engines with all three CC Racing pipes, the Powermaster 2" band aluminum pipe, the regular CC steel pipe and the all new Beast steel pipe. All three use 1" diameter headers and all three performed very well in their applications. The new Beast pipe however is a cut above the rest and is very well suited to this engine. You can read my review of the Beast pipe on Modelgasboats.com also. Here is a short video clip of my Aeromarine Conquest with a Beast engine and pipe. *Note: The Beast engine is a legal IMPBA LSG27 engine, but it is not a legal NAMBA G1 engine. For NAMBA G1, the Pro-Mod 260 fits the bill. Did you happen to check the sound levels with the Beast pipe? I've got one for a mono that I am putting together and want to keep my neighbours happy. My beast pipe is quieter then internal stinger QD Hotpipe that i have. You can always add a muffler though if you want it even quieter. Yes I ended up using the Beast pipes on both my Beast engines, but they run fine with all CC pipes I tested, and most likely with any good pipe out there. The Beast pipe did however pickup very close to 3mph on my Beast powered Conquest, so needless to say it stayed in there! Racing went well, just wasn't as lucky as I would have liked with the cat, but that's racing. Performance was excellent...driving skills were a little short of that! ha ha! Heading out to New Orleans next week for the 2010 Gas Nats...we'll see if lady luck will join me this time!